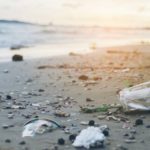 Most seasons bring up a few foods and moods that seem to stick to them. For me, summer is all about fresh fruit, wine and any kind of BBQ food I can enjoy. 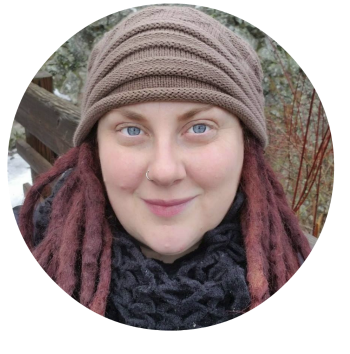 It’s about cool evenings, time spent outdoors and travel for me. While I would love to travel across the seas this year to a place like France, it’s just not in the cards. That doesn’t matter though, because I can bring France to my own backyard with the many affordable products that are made in France and available. If you are looking for some fun ways to celebrate the season of summer (or even throw a Bastille Day party- the celebration of French culture, July 14 this year) I whipped up some fun recipes using affordable French imported wines and cheeses! 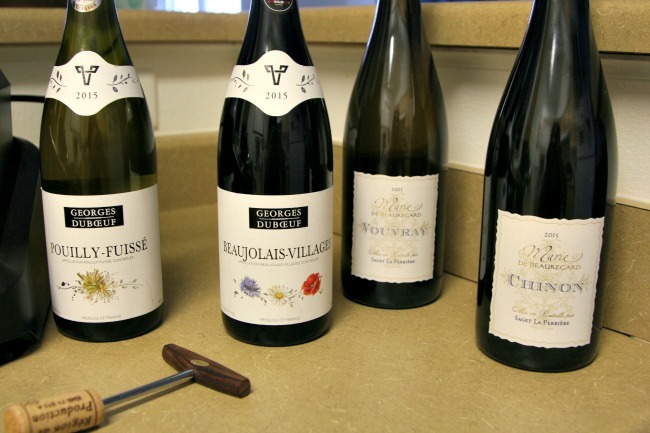 When you think of French wine, you probably think it’s out of your price range. First, I have to tell you how easily available and affordable imported French wines are. I was blown away to find out that wines made in France were not only a great value, but also the same as many wines made herein the US. Many like Saget La Perriere are right around $20 a bottle and taste really good. 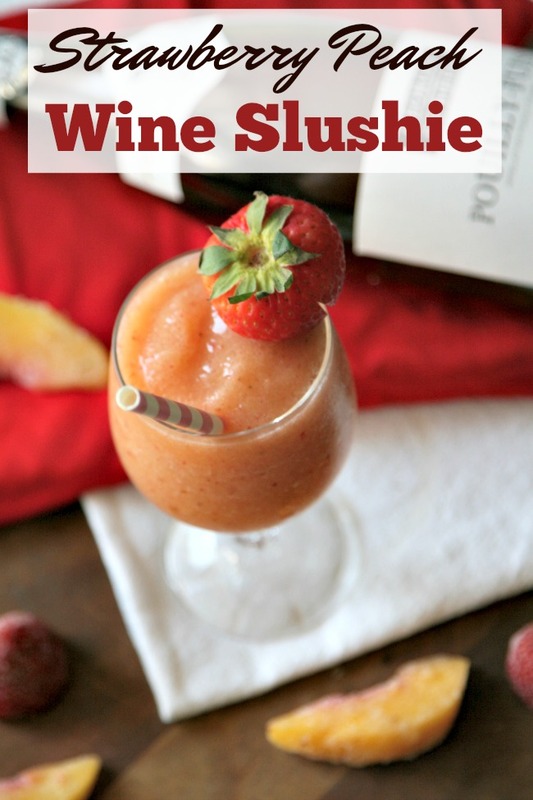 What I love about wine slushies is they can be made with any wine you enjoy because the wine gets sweetened up a bit with the fruit you add. 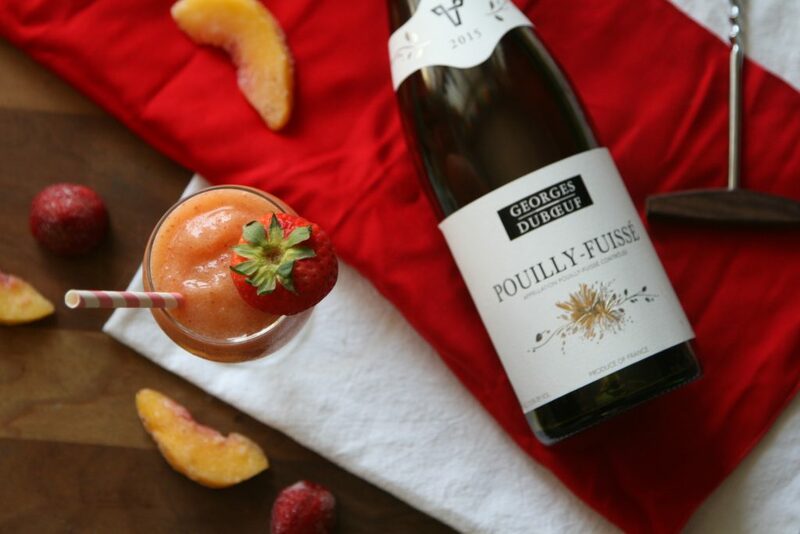 For instance, although these strawberry peach wine slushies are made with Georges DuBoeuf‘s Pouilly Fuisse, which is a white burgandy wine, you could kick things up with dark berries or cherries and use a Marie De Beauregaud Chinon for a more bold flavor combination. Other wines I recommend from France are Marie De Beauregaud Vouvray (a pale gold wine with honey and pear notes) or Georges DuBoeuf Beaujolais-Villages ( a darker fruity wine with notes of cherries and strawberries.) Play around with your favorite French wines and find your favorite for a wine slushie of your own design or create the one I made below. 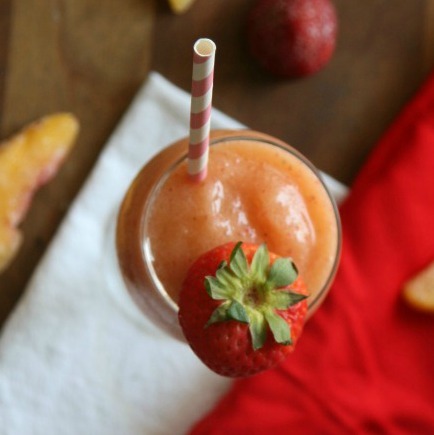 Simply add all the ingredients to a high powered blender and crush. 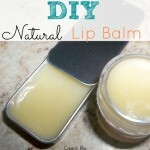 This recipe is so easy you can make it in less than a minute! This makes it perfect for backyard BBQ parties. I like to make these for guests on a hot summer day. 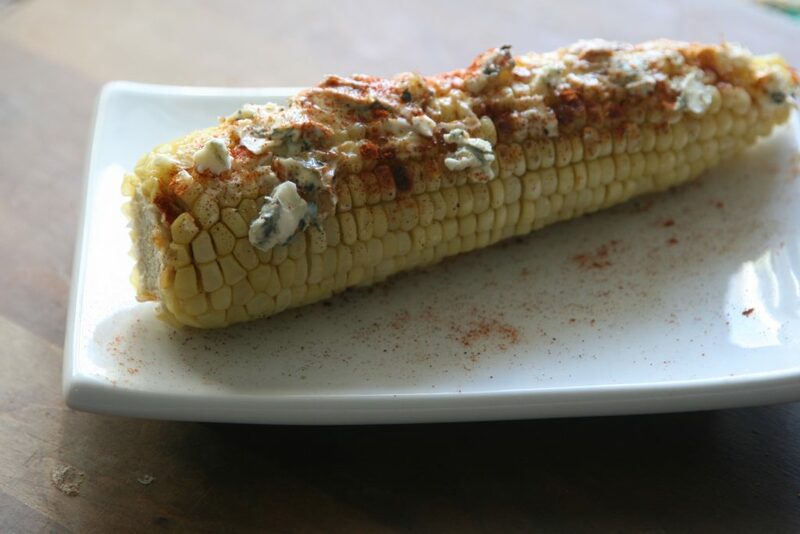 Who doesn’t love corn on the cob during a backyard BBQ? But don’t you get sick of the same old butter flavor? Kick it up a notch with this recipe right here! If you are looking for a good cooking cheese, lle de France cheeses are one of my favorite choices. You can’t beat the delicious creamy texture for just about any recipe. 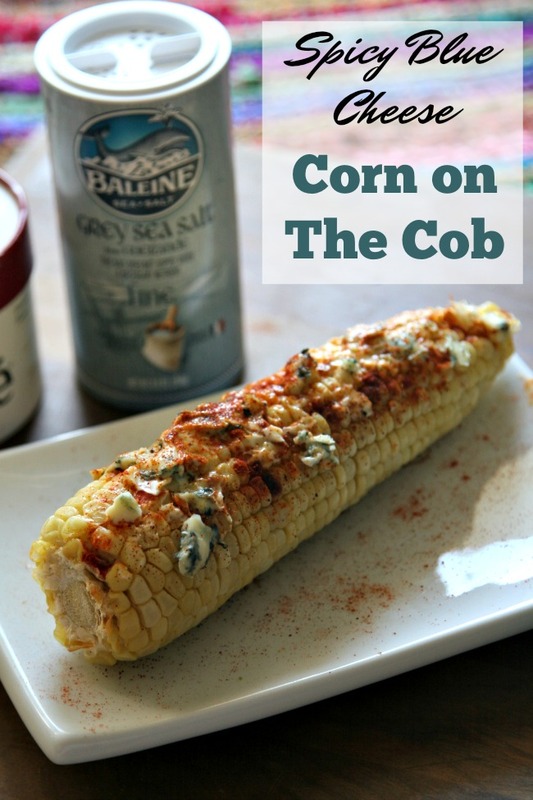 I personally am really loving St Ague blue cheese for this recipe because it is creamy and glides right onto the corn. 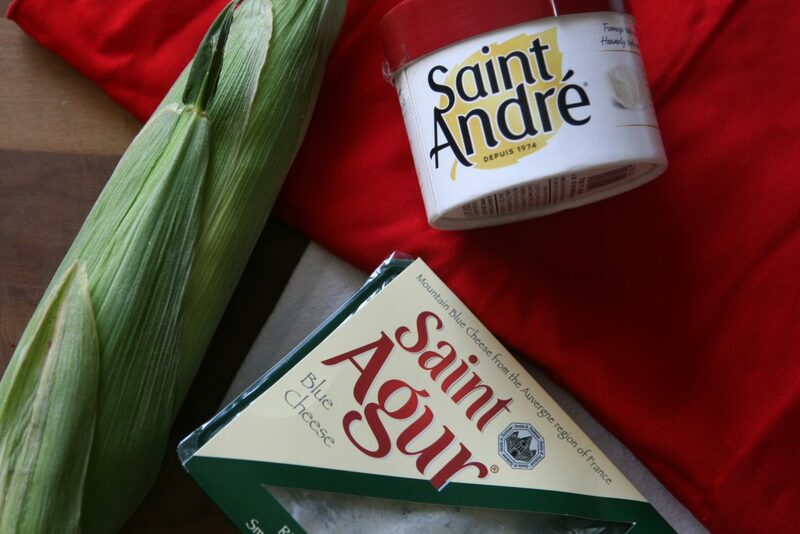 St Agur has a rich, buttery finish so it would really go great on steaks or burgers off the grill, too. You might also want to try thier St Andre as well. It goes well on summer cheese boards or even during craft beer tastings as we like to do here in the Pacific Northwest. Additionally, add some more French flair with some La Baleine Grey sea Salt. It is a natural salt that really lends itself well to recipes because it really makes flavors come out. Grill your corn in the way you like. I prefer to save a bit of time by getting my grill nice and hot, microwaving my corn in the husk (unshucked) for 3 minutes each and then taking them out and letting the grill kiss them a bit so they can develop just a bit of char without drying out. 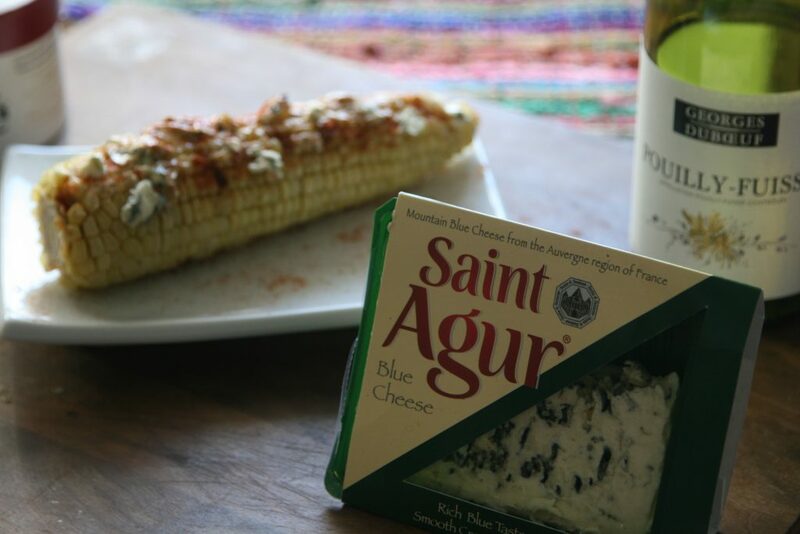 While your corn is grilling, melt your butter and stir in the St Agur blue cheese. Add a pinch of La Baleine grey salt. 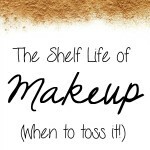 Using a brush, slather it on and top with a pinch of Cheyenne pepper. It is so easy to bring France to you! 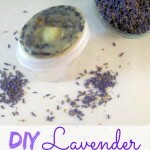 All of the products featured were made with love in France. Celebrate summer with some new tastes for your pallet.